I was recently craving oatmeal raisin cookies, which happen to be my favorite cookies in the whole world. After trying to ignore the craving for a week or two, I finally caved, and ventured to the store to get the missing ingredients. In addition to buying the missing ingredients, I also came across 100% whole wheat flour, which I’ve never used, so I bought some. The other day the boys and I got the taste for something sweet, but we didn’t have anything in the house, so I suggested that we make some cookies. Of course they thought that was a great idea, and I went to work finding a recipe and gathering ingredients. I started this post on Cinco de Mayo, but got distracted, so I hope you all had a happy Cinco de Mayo! I hope you enjoyed mucho tequila, chips y salsa, and whatever else it is you might celebrate with. At work we celebrated with a potluck lunch, and another salsa contest. Just like last year, my salsa reigned supreme! For my longtime readers, you know that I had a life before running, and that I do have other interests. One of those interests is cooking, and one of my favorite things to make is salsa. I love eating it, too. In fact, I love it so much, we have a party every year, celebrating Tequila and Salsa. Over the years I've used my coworkers as my informal taste testers for my salsa, so when a salsa contest was announced at work to celebrate Cinco de Mayo, many of them asked if I'd be entering. I've got to admit, I haven't made a whole lot of salsa over the last couple of months, and we were going to be pretty busy over the weekend before the contest, so I really wasn't sure that I wanted to enter. However, late Friday evening I decided to go ahead and enter. As it turns out, I didn't make it to the store to get my ingredients until Sunday night, and I didn't even start on the salsa until after 9:30 PM Sunday night. Within an hour, the salsa was ready and tasting good. Monday morning rolls around and I take the salsa to work and set it out for the judging, and what do you know, I win the contest! So now I am the proud maker of an award winning salsa! 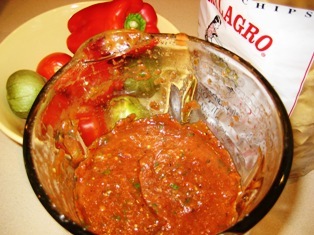 Does anyone know how to go about bottling salsa and getting it into the hands (and mouths) of consumers? Oh, and if you're interested, the winning salsa was based on my Perfect Salsa. For those of you who cannot get enough tequila or salsa, I'd like to remind you of my latest website: Tequila and Salsa Party. The Tequila and Salsa Party website is dedicated to, of all things, tequila and salsa--and consuming them with good friends. The website was created as a companion to the Tequila and Salsa Party, which we've held for the last two years. The Tequila and Salsa Party website contains not only information on our annual party, but also information on tasty salsas and tequila, as well as Mexican food that goes great with both. Make sure you head on over to the site, and subscribe to the feed for the latest in tequila and salsa. It's late...we've got a busy Saturday...I really should be getting to bed, rather than writing this blog post. But I've just got to get this salsa recipe out of my head and stored somewhere a little more permanent. Mmm...delicious! I think that I am very, very close to perfecting my salsa. On the heels of last weekend's success, and with the Tequila and Salsa Party less than two weeks away, I thought it was time to give it another go. Using last week's salsa (mine, not the Ersatz Papalote) as the basis, I put my roasted tomatoes in a pot on the stove, added chipotle peppers, salt, and some water, brought the whole thing to a boil, and then simmered for around 20 minutes. While the tomatoes and chipotle peppers were simmering away, I minced up some shallot, and chopped up some cilantro. (I also roasted some garlic earlier in the evening.) After about 20 minutes of simmering, I added equal parts red wine vinegar (less than last weekend) and white vinegar to the tomato mixture, and simmered another minute. I then poured the tomatoes and peppers into the blender, added the cilantro, shallots, and roasted garlic, and chopped until the salsa was a nice smooth consistency. Check out the final result in the picture, shown along with some homemade tortilla chips. 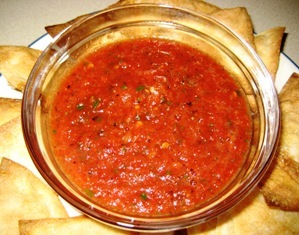 The salsa might just be the best I've ever made--I can't wait to try it tomorrow! My Dad's birthday was today, and I was asked to make some salsa and guacamole to go along with fajitas. Figuring that this would serve as good practice for the 2nd Annual Tequila and Salsa Party, and I never pass up the opportunity to make something tasty to share with family, I agreed. My guacamole recipe is pretty much set, with a slight variation from time to time, so the next step was figuring out exactly what sort of salsa I wanted to make. The salsas were excellent, as was the tequila, food, and the company. We will definitely be doing this one again. My mom started making these for my uncle when he went away to college. Approximately 40 years later, she still makes them every year for his birthday. Preheat oven to 350 degrees. Melt butter in 9x9 (13x9 if doubling) baking pan (in oven while preheating -- 2-3 minutes). Mix brown sugar, pecans, flour, and baking soda in bowl. Beat eggs. Add brown sugar mixture and vanilla to eggs and stir to mix. Pour in the center of the baking pan. Do not stir. Sprinkle powdered sugar on top using a strainer. I am a longtime fan of the magazine "Cook's Illustrated," as well as the accompanying television show, "America's Test Kitchen," and a recent subscriber to their website -- www.cooksillustrated.com. As such, I get the occasional email offer from them, usually for a new cookbook. In a recent email offer for their "Italian Classics" cookbook, they included a recipe for Chicken Piccata. I love chicken piccata, and have always wanted to fix it myself. I decided that this evening was as good a time as any to try it out. After a quick trip to the store, I began my prep work. There really wasn't much to it -- minced a shallot and some parsley, sliced and juiced a couple of lemons, and rinsed off some capers. Then it was time to season and flour the thinly sliced chicken and cook it. About 15 minutes later it was ready, sauce and all. It was good, but a bit salty (probably my fault, but could be from the capers or the chicken broth). The family liked it, including my 4-year old (always a good sign). If you're still reading, you're probably interested in the recipe. Unfortunately, I don't have a link to the recipe, but I'd be happy to forward the email with it to whoever wants it. Here it is: http://www.cooksillustrated.com/recipe.asp?recipeids=219 (might require free registration). For quite some time, I've been looking at French Press coffee makers. I'd heard from many people that when done right, they make the best cup of coffee. Before I could take the plunge and put Mr. Coffee away for good, I had to overcome a few hurdles. Laziness, no tea kettle, no burr grinder, and of course no French Press. There's no getting around my laziness, it is what it is. I figured I must simply bite the bullet, and see if French Press made coffee is worth the little bit of extra work. Today, I overcame the remaining hurdles and bought a tea kettle, a burr grinder, and a French Press. After getting home and washing everything, I set off on my coffee adventure. The first step was bringing some water to a boil. With a tea kettle, this is trivial, and suprisingly fast. While the water was coming to a boil, I used my new burr grinder to grind some coffee beans into a nice coarse grind. This was trivial as well. The grinder that I got has a coarseness setting, as well as a capacity setting...I simply set those to things and press "Start" -- no holding down a button, and counting. By now the tea kettle was whistling, so I took it off the burner briefly while I measured the ground coffee into the French Press. (You want the water to be just south of it's boiling point). I then poured in the water and stirred, put the French Press lid on, making sure that the spout was not open, and let it brew for about 4 minutes. After four minutes of brewing, I pressed plunger down, filtering out the grounds, and poured the coffee into my favorite mug. That's it. The coffee was ready in around 10 minutes. Now for the important question -- how's the coffee taste? In a word, delicious. It was worth the little bit of extra effort, and honestly, my laziness didn't even come into play. I've now put the Mr. Coffee away. I am sure it will make an appearance from time to time, but not often. At 4 PM yesterday afternoon, I decided to enter a chili cook-off that my department's social committee had organized as part of a Texas Independence Day themed pot-luck. Short notice, I know, but I knew I could work some magic in the kitchen. With such a short time-frame to work with, I didn't want to go the normal route of winging it completely, so I found a nice base recipe and then went to work. The end result was nothing short of phenomenal. I let myself start thinking about winning the cook-off (though winning was not the goal when I entered, I am way too competitive to keep it from becoming THE goal). As the other entries arrived, and people in the department began sampling, my confidence grew. The feedback was excellent. Then came time for the judging. There were three judges, and as far as I could tell, only one had any previous experience at doing this. Finally, the moment we had all been waiting for arrived. There was only to be the announcement of a winner -- no 2nd or 3rd place awards. However, the judges deviated from the rules and announced an honorable mention. This chili was voted #1 by one judge, while the eventual winner was tops with the other two. Mine was the honorable mention. Disappointed? Yes, but I could live with it. I figured the winning chili must be pretty damned good. Wrong! I tasted it and had to choke it down. A coworker spit it out. Others mentioned it as having an "almost rancid" taste. How does this happen? How does one chili win out with 2 out of 3 judges, while losing out with nearly everyone else? I demand a recount, an investigation, bribes must've been handed out, favors had to have been called in, the winner must've had dirt on two of the judges! For the record, it was the judge with previous judging experience that picked mine as #1. In the end, it was all good. My coworkers loved my chili. Who cares about the judges anyway. It isn't like there was some huge award for 1st place. My prize was a near perfect bowl of red, and the satisfaction of knowing my peers enjoyed it too. Before I forget, I want to thank my kitchen staff. Without you, I might have won...just kidding. I went with a couple of co-workers to check out the latest addition to the downtown Fort Worth restaurant scene today, Zolon an everyday bistro. The food was outstanding. I had the Western Salad and Three (pizza, see the menu). I also had a taste of Four (again, pizza, see the menu). Everything was delicious. Very fresh, and very tasty. Almost everything is offered in half-orders, and they suggest you go that route -- mixing and matching items to suit your taste. If you find yourself around Sundance Square in Fort Worth, and are in need of a meal, check out Zolon. Went to Stacey's Cafe for dinner this evening. Scott Adams is a co-owner. Surprisingly, aside from the menu (you must read the menu, which is available at their website), there was very little to tip you off that Scott Adams is involved in any way. By the way, the food was really good, I had the filet mignon -- cooked to perfection. I saw a magazine the other day while I was walking out of my local Barnes & Noble. I didn't flip through it or even pick it up (I don't even recall having ever seen this magazine before), but one of the stories listed on the cover caught my attention -- a month of dinners. I've just browsed through the recipes listed, and already I've found several things that I would like to try. The rosemary-garlic chicken looks like a good place to start. If anyone out there decides to try some of the recipes, please let me know how they turn out. OMG, this place is Goooood! It is just down the street from us, which is probably not a good thing, considering how much I love Tex-Mex.